If any item is missing or damaged, please contact your local D-Link Reseller for replacement. • Install the Switch on a sturdy, level surface that can support at least 6.6 lb. (3 kg) of weight. Do not place heavy objects on the Switch. • Make sure that there is proper heat dissipation from the Switch and adequate ventilation around the Switch. Leave at least 10 cm (4 inches) of space at the front and rear of the Switch for ventilation. First, attach the rubber feet included with the Switch if installing on a desktop or shelf. Attach these cushioning feet on the bottom at each corner of the device. Allow enough ventilation space between the Switch and any other objects in the vicinity. The Switch can be mounted in a standard 19″ rack. Use the following diagrams as a guide. Fasten the mounting brackets to the Switch using the screws provided. Plug one end of the AC power cord into the power connector of the Switch and the other end into the local power source outlet. After powering on the Switch, the LED indicators will momentarily blink. This blinking of the LED indicators represents a reset of the system. 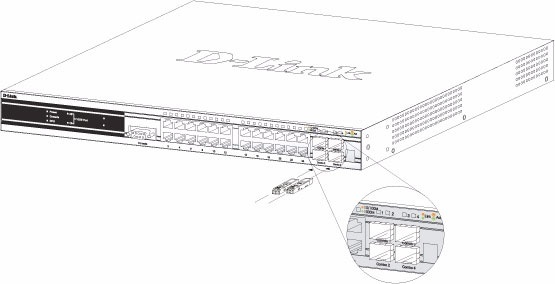 The D-Link DWS-3000 series switches are equipped with SFP (Small Form-factor Pluggable) ports,which are to be used with fiber-optical transceiver cabling in order to uplink various other networking devices for a gigabit link that may span great distances. These SFP ports support full-duplex transmissions, have auto-negotiation and can be used with DEM-310GT (1000BASE-LX), DEM-311GT (1000BASE-SX), DEM-314GT (1000BASE-LH) and DEM-315GT (1000BASE-ZX) transceivers. See the figure below for installing the SFP ports in the Switch. The rear panel of the D-Link DWS-3026 includes two open slots that may be equipped with the DEM-410X 1-port 10GE XFP uplink module, or a DEM-410CX 1-port 10GBASE-CX4 uplink module, both sold separately. Adding the DEM-410X optional module allows the switch to transmit data at a rate of ten gigabits per second. The module port(s) are compliant with standard IEEE 802.3ae, support full-duplex transmissions only and must be used with XFP MSA-compliant transceivers. The DEM-410CX uses copper wire medium, not optic fiber and therefore has a transmit length limit up to 1 meters. Compliant with the IEEE802.3ak standard, this module uses a 4-lane copper connector for data transfer in full-duplex mode. To install these modules in the D-Link DWS-3026 Switch, follow the steps listed in this section. CAUTION: Before adding the optional module, make sure to disconnect all power sources connected to the Switch. Failure to do so may result in an electrical shock, which may cause damage, not only to the individual but to the Switch as well. At the back of the Switch to the left are the two slots for the optional modules. These slots must be covered with the faceplate if the slots are not being used. To install a module in an available slot, remove the faceplate by loosening the screws and pulling off the plate. Unplug the Switch before removing the faceplate covering the empty slot. To install the module, slide it in to the available slot at the rear of the Switch until it reaches the back, as shown in the following figure. Gently, but firmly push in on the module to secure it to the Switch. The module should fit snugly into the corresponding receptors. Now tighten the two screws at adjacent ends of the module into the available screw holes on the Switch. The upgraded Switch is now ready for use. The Switch supports an external redundant power system (RPS). The diagrams below illustrate a proper RPS power connection to the Switch. Please consult the documentation for information on power cabling and connectors and setup procedure. How to Connect D-Link Switch (DES-3028) With the Console Port (RS-232 DCE)? The D-Link Switch provides an RS-232 serial port that enables a connection to a computer or terminal for monitoring and configuring the D-Link Switch. This port is a female DB-9 connector, implemented as a data terminal equipment (DTE) connection. ● A terminal or a computer with both a serial port and the ability to emulate a terminal. ● A null modem or crossover RS-232 cable with a female DB-9 connector for the console port on the D-Link Switch. 1.Connect the female connector of the RS-232 cable directly to the console port on the Switch, and tighten the captive retaining screws. 3.Select the appropriate serial port (COM port 1 or COM port 2). 4.Set the data rate to 9600 baud. 5.Set the data format to 8 data bits, 1 stop bit, and no parity. 6.Set flow control to none. 7.Under Properties, select VT100 for Emulation mode. 8.Select Terminal keys for Function, Arrow, and Ctrl keys. Ensure that you select Terminal keys (not Windows keys). NOTE: When you use HyperTerminal with the Microsoft® Windows® 2000 operating sys-tem, ensure that you have Windows 2000 Service Pack 2 or later installed. Windows 2000 Service Pack 2 allows you to use arrow keys in HyperTerminal’s VT100 emulation. See www.microsoft.com for information on Windows 2000 service packs. 9.After you have correctly set up the terminal, plug the power cable into the power receptacle on the back of the Switch. The boot sequence appears in the terminal. 10.After the boot sequence completes, the console login screen displays. 11.If you have not logged into the command line interface (CLI) program, press the Enter key at the User name and password prompts. There is no default user name and password for the Switch. The administrator must first create user names and passwords. If you have previously set up user accounts, log in and continue to configure the Switch. 12.Enter the commands to complete your desired tasks. Many commands require administrator-level access privileges. Read the next section for more information on setting up user accounts. See the D-Link DES-3028/DES-3028P/DES-3028G/DES-3052/DES-3052P CLI Manual on the documentation CD for a list of all commands and additional information on using the CLI. 13.When you have completed your tasks, exit the session with the logout command or close the emulator program. 14.Make sure the terminal or PC you are using to make this connection is configured to match these settings. If you are having problems making this connection on a PC, make sure the emulation is set to VT-100. You will be able to set the emulation by clicking on the File menu in you HyperTerminal window, clicking on Properties in the drop-down menu, and then clicking the Settings tab. This is where you will find the Emulation options. If you still do not see anything, try rebooting the D-LinkSwitch by disconnecting its power supply. Once connected to the console, the screen below will appear on your console screen. This is where the user will enter commands to perform all the available management functions. The D-Link Switch will prompt the user to enter a user name and a password. Upon the initial connection, there is no user name or password and therefore just press enter twice to access the command line interface. 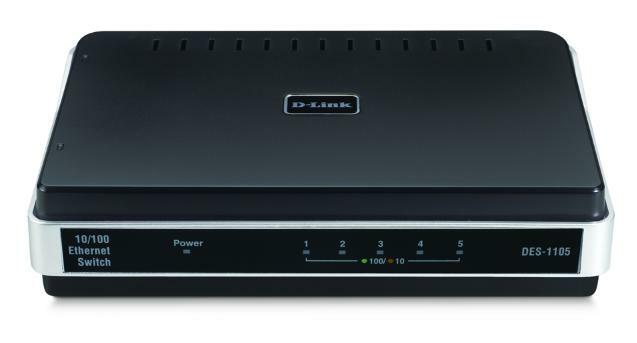 Add more computers, gaming systems and cameras to your network without slowing down your connection with the D-Link DES-1105 5-port Unmanaged Desktop Switch. Expand your wired home network with the D-Link 5-Port 10/100Mbps Desktop Switch (DES-1105). This Desktop Switch fits virtually anywhere because of its compact size. Its power connector and ports are conveniently located in the rear to avoid messy cables on the desk. This Desktop Switch can also be mounted on a wall or underneath a desk with the included wall mounting kit. The Desktop Switch receives and forwards traffic seamlessly with its non-blocking wire-speed architecture. Every port simultaneously supports up to 200Mbps of bandwidth, totaling 1Gbps of switching capacity. It minimizes bottlenecks, allowing your network to run smoothly even during the heaviest volume of traffic. This Desktop Switch requires no configuration and installation is simple. Whether you are connecting the Desktop Switch to another switch or a computer, there is never a need for crossover cables with Auto-MDI/MDI-X support. Additionally, the Desktop Switch auto-senses if the network device it is connected to is running at 10Mbps or 100Mbps and adjusts accordingly. Equipped with a comprehensive LED display, you can monitor the status and activity of every port at a glance. With outstanding performance, quality, and features packed in a compact sized device, the D-Link 5-Port 10/100Mbps Desktop Switch (DES-1105) is a great selection for expanding your home network. Connect any USB device AND give 4 of your favorite devices their own Gigabit Ethernet port – get comprehensive, high-performance wireless coverage to any device, anywhere in your home. This Article describes the procedure for resetting passwords on D-Link Switches. Authenticating any user who tries to access networks is necessary and important. The basic authentication method used to accept qualified users is through a local login, utilizing a Username and Password. Sometimes, passwords get forgotten or destroyed, so network administrators need to reset these passwords. This document will explain how the Password Recovery feature can help network administrators reach this goal. The following steps explain how to use the Password Recovery feature on D-Link devices to easily recover passwords. 1.For security reasons, the Password Recovery feature requires the user to physically access the device. Therefore this feature is only applicable when there is a direct connection to the console port of the device. It is necessary for the user needs to attach a terminal or PC with terminal emulation to the console port of the switch. 2.Power on the D-Link DGS Switch. After the runtime image is loaded to 100%, the Switch will allow 2 seconds for the user to press the hotkey [^] (Shift + 6) to enter the “Password Recovery Mode.” Once the Switch enters the “Password Recovery Mode,” all ports on the Switch will be disabled. 3.In the “Password Recovery Mode” only the following commands can be used. reset config The reset config command resets the whole configuration back to the default values. reboot The reboot command exits the Reset Password Recovery Mode and restarts the switch.A confirmation message will be displayed to allow the user to save the current settings. reset account The reset account command deletes all the previously created accounts. reset password The reset password command resets the password of the specified user. If a username is not specified, the passwords of all users will be reset. show account The show account command displays all previously created accounts. After you perform the physical hardware installation, you need to connect the D-Link Unified Switch to the network. The default IP address of the switch is 10.90.90.90/8, and DHCP is disabled by default. If you want to enable DHCP on the switch or assign a different static IP address, you must connect to the DWS-3026 switch and change the default settings. You can connect to the switch through Telnet or a Web browser from a host on the 10.0.0.0/8 network, or you can connect to the switch through the console port (RS-232 DCE). After you connect to the switch, you can provide network information or enable the DHCP client. To connect to the DWS-3026 switch from a host on the 10.0.0.0 network, enter the default IP address of the switch (10.90.90.90) into the address field of a Web browser or a Telnet client. 1. Using a null-modem cable, connect a VT100/ANSI terminal or a workstation to the console (serial) port. If you attached a PC, Apple, or UNIX workstation, start a terminal-emulation program,such as HyperTerminal or TeraTerm. 3. Press the return key, and the User: prompt appears. Enter admin as the user name. There is no default password. Press ENTER at the password prompt if you did not change the default password. After a successful login, the screen shows the (switch-prompt)> prompt. 4. At the (switch-prompt)> prompt, enter enable to enter the Privileged EXEC command mode. There is no default password to enter Privileged EXEC mode. Press ENTER at the password prompt if you did not change the default password. 5. Configure the network information. – To use a DHCP server to obtain the IP address, subnet mask, and default gateway information, enter network protocol dhcp. – To use a BootP server to obtain the IP address, subnet mask, and default gateway information, enter network protocol bootp. network parms 192.168.2.23 255.255.255.0 192.168.2.1 The default gateway is an optional parameter, so you do not need to enter an address to execute the command. To view the network information, enter show network. Once the D-Link Unified Switch is connected to the network, you can use the IP address for remote access to the DWS-3026 switch by using a Web browser or through Telnet or SSH.